Hey guys! I just got home, anyone wanna see pics? I been up 33 hours and you'd think i'd want to go to bed, but I am still excited! I am taking pics off my camera right now. I have mpeg movies too but don't know how to send, use youtube? This is kind of the icing on the cake...so to speak. I had a few email "tips" sent my way about the guy in chat who kept crashing the server. His screen name was "a" and kept flooding the server which caused a nightmare. Well I guess he was caught via I.P and I was actually surprised when I found out who it was. Wasn't he one from New Orleans, whom we helped after Hurricane Katrina ? The group there displaced to Georgia/North Carolina. That I don't know, but I was just told this information in an email. When I went to look for myself, he admitted doing it and getting banned. Whether that is true or not, I cannot say. can i post pics here or is there something special set up instead? There is a thread in the Construction Zone for pics.....and you can always post them here also. Wasn't he (Emc209i) one from New Orleans, whom we helped after Hurricane Katrina ? The group there displaced to Georgia/North Carolina. 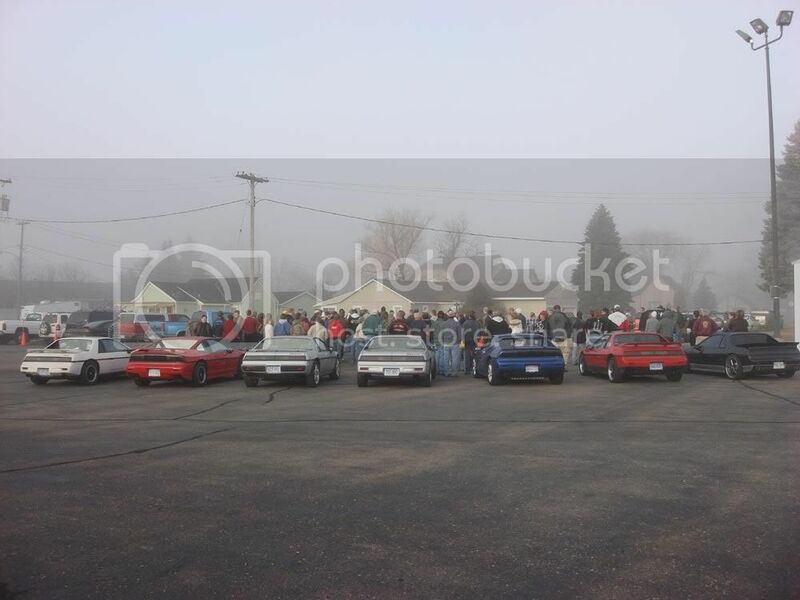 Fieros line the edge of the reveal location.. Still uploading and processing on You Tube : ( I will post a link as soon as it is done OK? How do you post PICS on here? Us a Picture Trail account or something? Did I say "yellow" in the chat yesterday or didn't I ???!!!!! I was going to say a clue was in someones name but i think thaqt would be pushing it. Amazing job guys. It's things like this that make me wish my job allowed weekends off. You all have a lot to be proud of and I think you have done an amazing job for Tyler. My hat's off to you all. 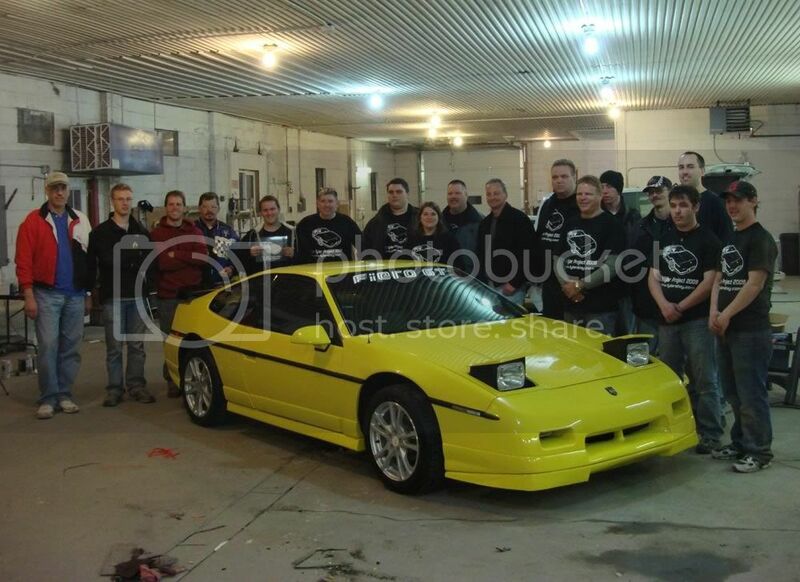 I would be willing to bet that this is the first time so many people have been involved in putting a fiero together since the factory closed!! Hey Everyone. The story ran in the Minneapolis Star-Tribune. This was a little prank played on VikingRedBaron by Karen who along with her husband Dave owns the shop we used! This was I'd say about 4 or 5am and he slept thru her painting both middle finger nails! Not to mention all the car building noise during his short nap. Than back to work . How long ago was he banned? Emc209i was the username that caused so much grief and caused chat and video to be down timeframe = around 3-4am. Earlier in the day, he may have used "A", but later on used Emc209i for sure. Somewhere in a pile of screenshots, I have where his ip was logged, and he actually 'confirmed' who he was. Gosh, it justs make me cry every time I read this stuff. Something very beautiful happened here, in our special place of the internet, and in a small town called Frazee. In the wee hours of morning I busted someone who will go nameless (Lynxer) who found a creative way to prop himself up for a nap! Nick is such a good friend. I think a lot of us would like to have a friend like him. Ok a bit blurry cause my camera was on some funky setting but....more evidence that wee morning hours working on Fieros messes with the mind Synthesis and his "bling". Stress relief by means of comedy! Seriously, very cool of you to go out there and help. Finally home from work and got to see the pictures. The car looks AMAZING. I still can't express how much you all rock. Seriously. Hulki, I owe you all kinds of beer and what not when you get back for starting this. Synthesis, If I ever meet you I'll be sure to buy you a beer or two as well. This whole thing hits very close to home for me. My grandmom is terminal with cancer and was just released two days ago from the hospital to "pass comfortably at home". She's a tough Irish lady and is still hanging in there, hopefully until I at least can see her again on Tuesday. My only regret is that I couldn't be out there myself with you guys. You seriously, seriously rock. Just got back home to mid-michigan . However with 38 hours and no sleep i....think....might....go...to......zzzzzz. This was a little prank played on a friend of Lynxers by Karen who along with her husband Dave owns the shop we used! This was I'd say about 4 or 5am and he slept thru her painting both middle finger nails! Not to mention all the car building noise. This was VikingRedBaron and I only slept an hour or so. It was from 5 to 6:30 and Yes I am tired. And Karen, is there a warranty on the paint job? They are cracking already, and I have not even washed them yet !!! I did however manage to drop off a couple if the out of state "Dream Team Members" off at the Airport this afternoon. I will add a couple pics tomorrow. Much needed sleep to follow this post. Just got home now, It was such a great time up there! Everyone was great to us. And the car turned out great!! I still getting choked up just thinking about this. 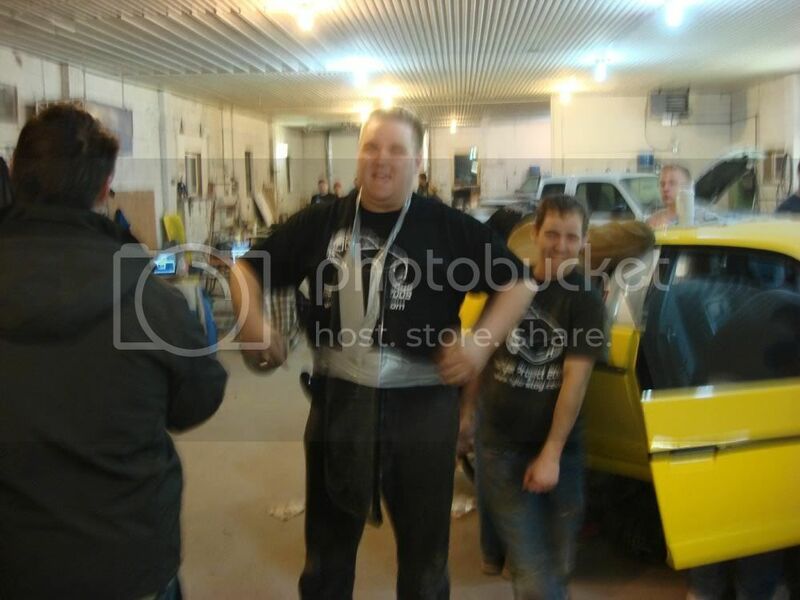 It was great to meet all you that were there helping with the build. I have some pictures i'll be posting later after i get some sleep..! Again thanks to all that were there and to everyone that joined use online all day!! Very nice vid, Antuzzi! I'm still amazed at how well the car turned out. 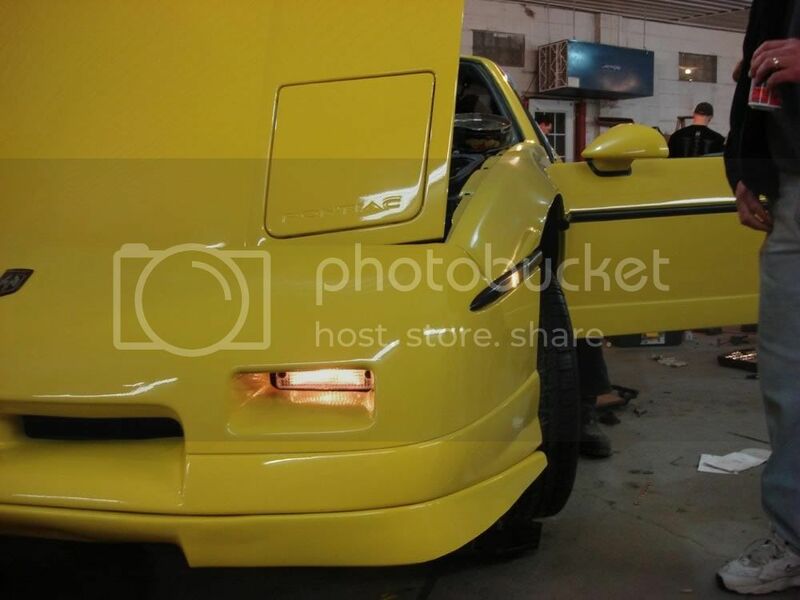 * 1988 Black Fiero Formula (2001-2004) Was to be a 3800SC, badly rusted rear frame. * 1988 White Fiero GT (2009 - Present) This one's a keeper! I hope you had a great trip back to Michigan. Thanks for representing Michigan! 2.5 is there anyway of getting the large hi-res version of that group photo by the car? I'd love to rock that as my wallpaper for a while. Yes that was great all the different pictures mixed with the video!